What’s new: Additions include OF Michael Brantley, C Robinson Chirinos and LHP Wade Miley. Gone are C Brian McCann, UT Marwin Gonzalez, DH Evan Gattis, LHP Dallas Keuchel and RHP Charlie Morton. 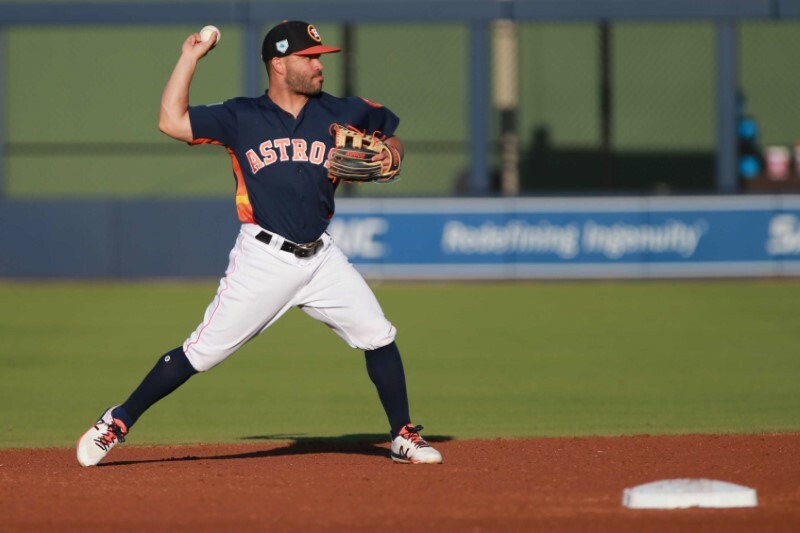 Cause for concern: Versatile RHP Lance McCullers Jr. is out for the 2019 season after needing Tommy John surgery, and former top right-handed pitching prospect Francis Martes is suspended 80 games after testing positive for a performance-enhancing substance. Ace RHPs Justin Verlander and Gerrit Cole are each on track to become free agents after the season. Projecting 2019: The Astros are once again among the favorites in the AL, returning a star-studded roster that will benefit from the addition of three-time All-Star Brantley. With Verlander leading the staff, pitching remains a strength, and top right-handed pitching prospect Forrest Whitley isn’t far from adding himself to the mix. Outfield prospect Kyle Tucker could stick in the majors after making his debut last season, adding to a core that received a long-term boost in the form of 3B Alex Bregman’s six-year, $100 million extension. What’s new: Additions include C Jonathan Lucroy, 1B Justin Bour, RHPs Matt Harvey, Cody Allen and Trevor Cahill and new manager Brad Ausmus. Gone are RHP Garrett Richards and former skipper Mike Scioscia. Cause for concern: DH Shohei Ohtani (Tommy John surgery) won’t be ready for Opening Day in addition to not being able to pitch all season. LHPs Tyler Skaggs (forearm) and Andrew Heaney (elbow) remain injury-prone this spring. Projecting 2019: The Scioscia era has come to an end in Los Angeles, but the Angels made sure the Mike Trout era will last the bulk of the star outfielder’s career with a record-shattering, 12-year deal worth more than $430 million signed this spring. Trout remains a perennial MVP candidate capable of keeping the Angels in striking distance in the AL nearly himself. He’ll soon get help in the form of top outfield prospect Jo Adell, who reached Double-A last season. What’s new: Additions include UT Jurickson Profar, OF Robbie Grossman and RHP Marco Estrada. Gone are C Jonathan Lucroy, 2B Jed Lowrie and RHPs Trevor Cahill and Jeurys Familia. Cause for concern: LHP Sean Manaea’s 2019 season is in question as he continues to recover from arthroscopic shoulder surgery. Meanwhile, 1B Matt Olson (29 HRs in 2018) will miss the early portion of the season after undergoing surgery to address a hand fracture. Projecting 2019: It’s tough to gauge expectations for the A’s, who shocked baseball with a playoff run last season after three straight last-place finishes in the AL West. The roster remains one of the cheapest in baseball and short on star power, but 3B Matt Chapman is poised for superstardom after proving he’s more than a glove at the hot corner last season. Left-handed pitching prospect A.J. Puk’s expected return from Tommy John surgery could offer a bright look into Oakland’s future, though the Athletics’ stock took a hit when 2018 first-rounder Kyler Murray announced he intends to play in the NFL over MLB. What’s new: Additions include C Omar Narvaez, 1B/DH Edwin Encarnacion, 1B/OF Jay Bruce, SS Tim Beckham, OFs Domingo Santana and Mallex Smith, LHP Yusei Kikuchi and RHP Hunter Strickland. Gone are 2B Robinson Cano, DH Nelson Cruz, SS Jean Segura, RHP Edwin Diaz, C Mike Zunino and LHP James Paxton. Cause for concern: RHP Felix Hernandez couldn’t hold a rotation spot last season; he’ll make $27 million in the final year of his contract in 2019. The loss of Cano, Cruz and Segura isn’t offset by the additions of Encarnacion and Bruce, and Diaz saved 64 percent of the team’s wins last season. Projecting 2019: After years of appearing poised to end their lengthy playoff drought, the Mariners blew it up this offseason and appear headed toward a rebuild. Seattle could bounce back quickly, though, as key pieces obtained in trades — such as LHP Justus Sheffield and RHP Justin Dunn — aren’t far from the majors. Adding former top shortstop prospect J.P. Crawford from the Phillies gives Seattle a wild card as it looks to establish a new core. What’s new: Additions include C Jeff Mathis, 3B Asdrubal Cabrera, OF Hunter Pence, RHPs Lance Lynn and Shelby Miller, LHP Drew Smyly and first-time manager Chris Woodward. Gone are 3B Adrian Beltre, C Robinson Chirinos, UT Jurickson Profar and RHP Bartolo Colon. Cause for concern: Texas committed more errors than any other AL team last season, and overcoming that flaw doesn’t figure to get any easier with Beltre’s retirement. Behind LHP Mike Minor, the Rangers’ rotation is a bunch of question marks. Projecting 2019: The Rangers are making things interesting with gambles on arms such as Smyly and Miller, but it’s likely the team will once again struggle this season. Further development from RF Nomar Mazara and cutting down LF Joey Gallo’s lofty strikeout totals will be key areas of focus as Texas continues its rebuild, which isn’t expected to leap forward as none of the team’s top prospects have played beyond Double-A.